Doggy Daycare - K9 Korral, Inc.
Because we have the greatest customers in the world, we are have expanded doggy daycare once again.. The small dogs have moved back to the original doggy daycare building. The old building has all of the amenities for the dogs that new building has, it is just missing the viewing room for the 2 legged customers. We have even added a new safety feature to the outdoor play area for the small dogs. 3000sq ft of netting is covering the outdoor play area, protecting the little dogs from threats from the skies. In the newer building for the summer we have separate areas for the larger, younger, more rambunctious crowd and another area for the more mellow and older large dogs. 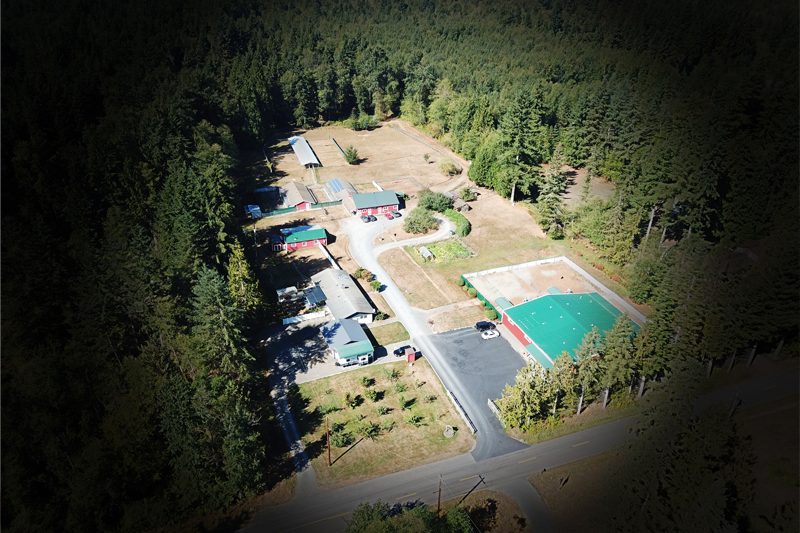 Between the two daycare rooms and out door play areas, we have 5,100 sq ft of indoor play area and 12,000 sq ft of fenced outdoor play areas. The floors are all covered with a sealed rubber flooring that is gentle on joints. Everything in both rooms is 100% cleanable, even the walls have a commercial, plastic covering that gets washed daily. The outdoor play areas are covered with cedar hog fuel (shavings) to try and keep the dogs clean on even the wettest days. And every area of our facility is double doored or gated for those dogs who like to door dash. Doggie Daycare is one of the newest services available for dog owners. It is a place where dog owners can bring their dogs for the day and they can play, relax, and socialize together with dogs and be supervised by experienced dog handlers. Every dog has to be both dog and human friendly so there is a selection interview that each dog has to pass. While you are at work during the day you will have peace of mind knowing that your four-legged friend is being played with and well cared for. 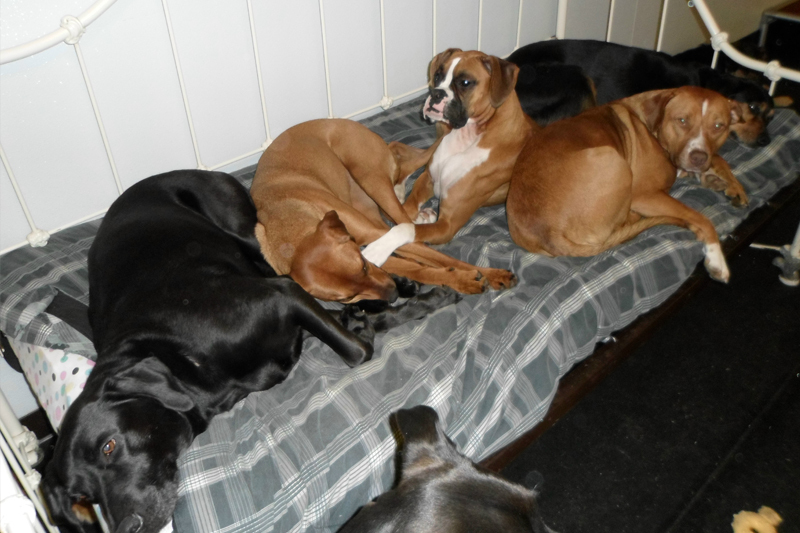 Our doggie daycare is in a controlled, safe, dog-friendly environment. There are activities throughout the day to keep the dogs active and entertained and in the midst of all the play and fun they'll also learn some basic manners and commands. Dogs are animals and need to interact and play throughout the day. Without this interaction they can become destructive and develop behavior problems like incessant barking, tearing up the house or regression in housebreaking. The most important period in a puppy's stage is age 16 weeks where all the experiences they have help them to form their adult personalities. You will have peace of mind knowing that your dog is well cared for by experienced professionals and your dog will be just as tired as you are at the end of a busy day. So harness up your little doggie and herd 'em on down to the K9 Korral. 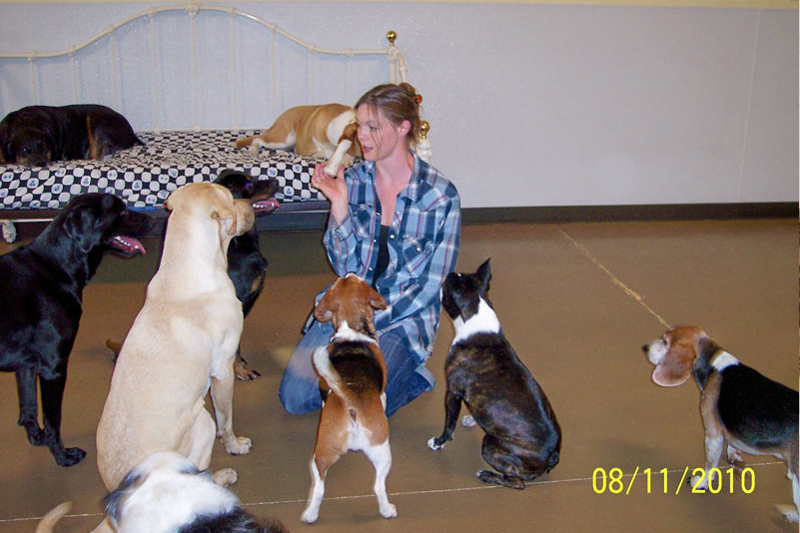 Our new doggy daycare building opened on July 6, 2009. It is truly a design that took years to refine. The indoor facility is a temperature controlled 3600 sq ft room (bigger then most homes). We now have our big dog daycare room separated into three areas, mature dogs, high energy dogs, and high energy really rambuntious. The floor is covered with a rolled rubber flooring that is easy on the joints and feet. The floor is also usually littered with an assortment of toys to play with. And there are still beds on each side so the dogs can take a short nap when their batteries start to run low. The outdoor area is over 8000 sq ft of cedar playground chips that are easy on the dogs feet, and helps keep them clean in all types of weather. This area is also separated into three areas just the big room. There are toys and playground equipment to play with and on. There is even an open, outdoor covered area so when the dogs want to be outdoors but in the shade or out of the rain, And finally, there are doggy doors in each area, so all dogs can come and go as they please to the comfort of the big room, or out to the secure, outdoor play area. For the parent that likes to watch their dogs play, we now have a viewing room with tinted windows making hard for the dogs to see out. 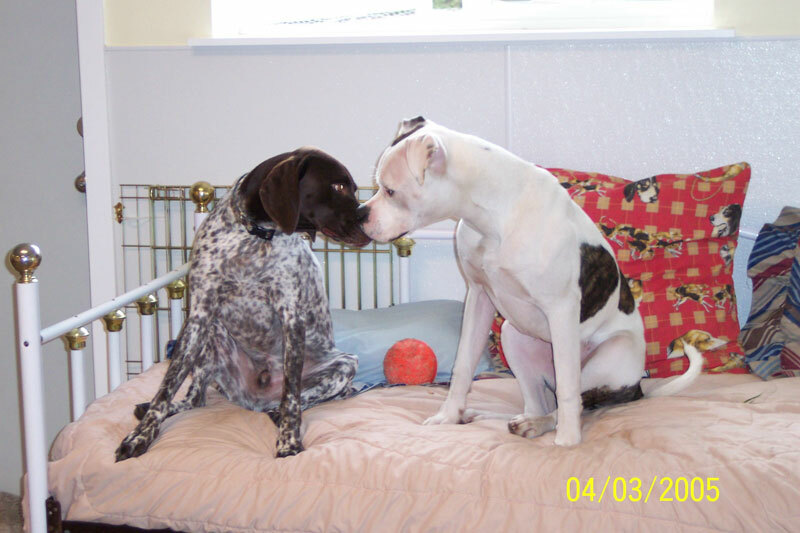 You will be able to watch your dog interact with other dogs and play, without them knowing you are there. Requirements: We require proof of vaccinations from a veterinarian for Rabies, the Distemper combination, and Bordatella for all dogs. All dogs need to be on some flea prevention program. All must also be spayed or neutered if they are over the age of 6 months.